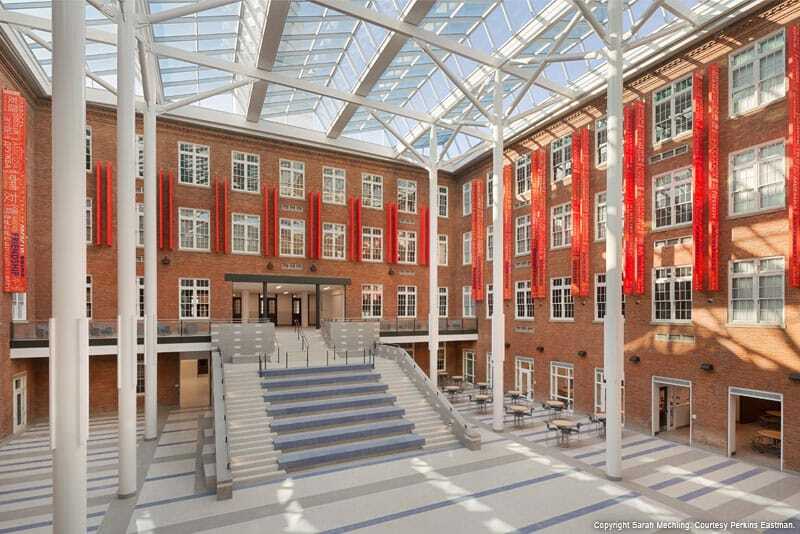 Brightened by the new grand skylight installed in the refreshed atrium and the restoration of a courtyard on the north side of the site, the high school has new life. 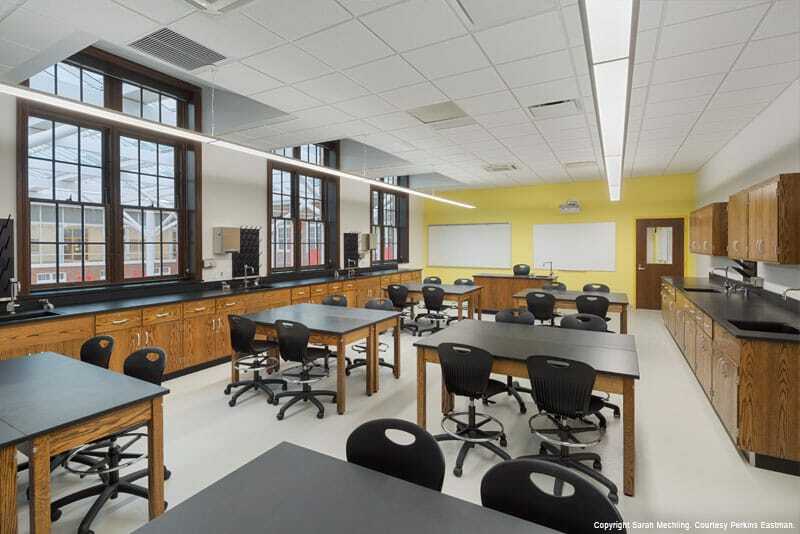 By the end of October2015, Roosevelt High School was completely transformed from an old, dilapidated 1930’s high school to a new 21st century learning environment. Its crumbling ceilings and cracked floors were restored to their 1930’s glory, while the dark and gloomy interior became a thing of the past. In the 1970’s an infill addition was constructed to create more enclosed square footage for the high school students. With our 21st century modernization, the original 1930’s courtyard has been reopened as a waterworks courtyard by demolishing the addition that had been built to cover it up. The waterworks courtyard is one of the many sustainable features of the newly renovated high school, containing 3 cisterns with the capacity to hold 55,000 gallons of water for flushing toilets. It will be used as a teaching tool for students to learn about storm water management. On the other hand, the atrium that was once an open-air courtyard between the original 1930’s building and the infill addition, is now an enclosed atrium designed as “the heart” of the building. Standing in the atrium are 65-foot columns, which had to be welded off-site due to their magnitude. Enclosing the atrium is the 10,000-square foot skylight that has turned this once unused space into a gathering point and social area. The skylight uses electrochromic glazing, which reacts to sunlight in order to cut down on heat gain that in turn requires less energy to cool the space. 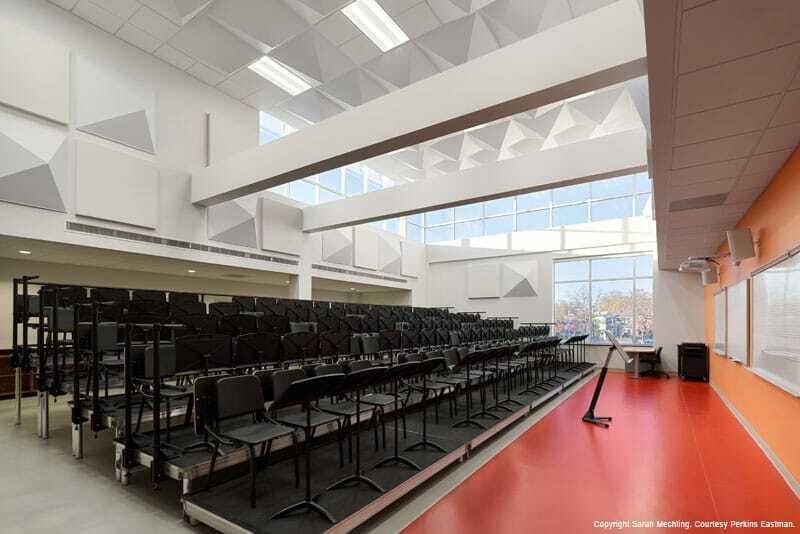 Through value engineering, the Smoot | Gilbane joint venture team was able to keep this essential design element without exceeding the budget. Surrounding you as you stand in this newly revitalized space are the beautifully restored 1930’s windows. The windows are an example of the craftsmanship that has gone into making this building magnificent. Worcester Eisenbrandt, along with AVSmoot, a woman-owned CBE contractor, brought the 100 worn down and out-of-date historic windows back to their 1930’s splendor. The double-hung windows use special hardware to hinge the sashes, while the frames were sealed to the brick for waterproofing. Therefore, the entire window could not be removed and had to be restored in phases. The sashes were removed and restored off-site at AV Smoot where they were stripped, re-stained, and glazed to ensure proper sound control. As for the frames, Worcester Eisenbrandt restored them in-place using the same process. Another defining element of the design is the commanding cupola that sits atop the high school that was restored to its original specifications. From looking at the original historic 1930’s drawings, the team believed it wasn’t initially built the way the designer had intended. 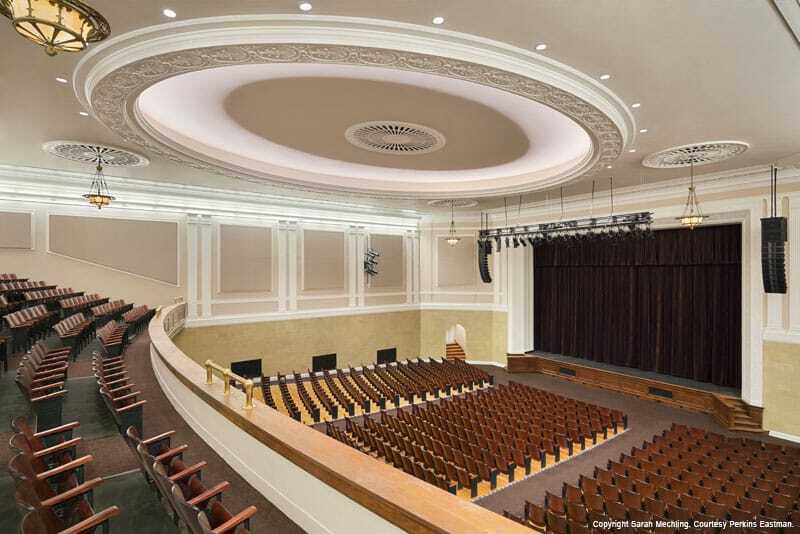 Smoot | Gilbane and Perkins Eastman DC worked with the Historic Preservation Review Board to fill in the design gaps so that our team could get the details just right. They then ripped it down to its steel structure and built it the way it was originally intended. By hiring companies like AVSmoot, Smoot | Gilbane surpassed both the project’s CBE and DC resident workforce participation goals. Our team now has a proven track record that has resulted in over 50% local participation on District of Columbia projects. It is our goal with every project, including Roosevelt, that we assure local businesses are given a real opportunity to participate in the very projects their tax dollars support.